In this economy, it’s easy to blame the unsuccessful job search on the market. Maybe you assume you’re not getting interviews because nobody is hiring or you’re not getting the job after the interview because there’s such high competition out there that you have a lesser chance. But, is that really the case or is it just an excuse for a lack of effort? Yes— it’s difficult to find jobs—but they are out there and it is possible. Remember, finding a job is really a job in itself! It’s easy to start out strong —you’re motivated and you haven’t become jaded yet. After several unsuccessful applications and interviews, motivation can dwindle, leaving you tempted to do the bare minimum. That, quite frankly, is not good enough to get you hired. You could be doing everything right and it just hasn't happened yet. If so, don’t worry, it will. Just to be on the safe side, think about the way you’re currently approaching the job hunt to determine whether it’s the lack of jobs or simply a lack of effort keeping you from obtaining your dream position. 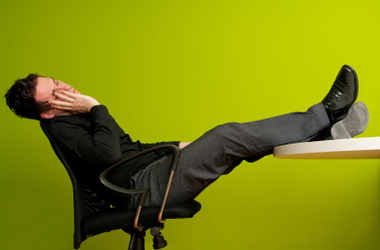 Consider the following signs to make sure you aren't just slacking off in your job pursuits. 1. I just need a job – who cares if it’s the right one? Yes, you have bills to pay but is misery really worth it? You’ll likely be unhappy in just any job, so try to find the job that suits you best because, odds are, you’ll excel at it if you love it. 2. I use the same standardized cover letter and resume for each job I apply for. This is simple. Generic cover letters and resumes aren’t effective. You want to grab the hiring manager’s attention with details of why you want that particular position and why you would be perfect for that particularjob. It’s impossible to create generic documents that scope everything all potential employers are looking for in a candidate. If you do, you’ll likely end up in the pile of rejections. 3. I only apply to jobs I find posted online. While searching online is a great way to look for job openings, it shouldn’t be the only way you’re searching. Your competition increases with jobs posted to the internet, so you’re much better off developing and utilizing your professional network. 4. I don’t prep my references before giving them to potential employers. Basic manners indicate that you should give your references the courtesy of notification that they may be receiving a call about you. If you reach out to let them know someone may contact them, it will also open a door to letting them know the position you’ve interviewed for and what the hiring manager is looking for in a job candidate, so that they can emphasize certain qualities you possess. In the end, it will help your chances of securing the position. 5. I have no clue what my references say about me. You should be aware of what your references are telling potential employers. If you’re unsure, ask! There’s nothing wrong with calling a former employer and asking if they can be honest about the type of recommendation they would give you. You don’t want references that say the bare minimum, it’s always better to find people that are enthusiastic about your job performance. If you don’t have that option, politely ask if they would be willing to become neutral, rather than negative. Nothing is more condemning than a negative recommendation! If they refuse, don’t use them as a recommendation anymore. 6. I don’t prepare that much for my interviews. You should spend several hours prepping for interviews. Research the potential employer and learn more about the company you’ll be working for. Also, look into the industry and try to learn as much as possible about the people who will be interviewing you (if you know who will be interviewing you). Review your resume and practice potential interview questions so you won’t be caught off guard during the actual interview. Believe it or not, even if you don’t review the exact questions, you’ll be more prepared for questions all around. 7. I don’t think I need to send follow-up thank-you notes after job interviews. Again, this comes down to common courtesy. While some believe that thank-you notes are unnecessary, you shouldn’t count anything out that may make you stand apart from other job candidates. In the note, thank the interviewer for taking the time to speak with you and let them know you sincerely appreciate their interviewing efforts. Be sure to reiterate your strong interest in the position and refer to your interview discussion. This allows the interviewer, who is probably interviewing multiple candidates, to recall your conversation. It also shows you were listening during your discussion and personalizes your note. For example, “I was pleasantly surprised to learn that the marketing position entails social media responsibilities! I’m confident that I would excel at this task, based on my prior experience with the creation and implementation of social media content at Company X.” Your note doesn't have to be handwritten, an email also works, but a handwritten note can show that you’re willing to put in the extra effort, a great quality that any employer would love for an employee to possess. 8. I don’t help people out. Have you ever heard the saying, “I’ll scratch your back, if you scratch mine?” If you help others out, they are more inclined to help you in the future. During your job search, you will undoubtedly come across positions that don’t suit you, but you may know someone else that would be a perfect fit. It doesn’t take much effort to let people know you’re thinking of them or refer them when you get a chance. If you come across articles they might find interesting, send them their way. It shows you’re thoughtful and kind. People like to recommend thoughtful and kind people for jobs. When you’re networking, consider whether two separate contacts may benefit from meeting one another. Perhaps you’re not in a particular field, but you have a friend who is. Introducing people to one another is a great way to build your network because they will be more likely to do them same for you in return. These efforts help build your professional network and keep you at the front of people’s minds when they hear of job openings. OK—if you’ve gone through the list and came out with flying colors, it’s likely you’re doing everything right. You just haven’t found the right job yet – don’t sweat it. If you saw some red flags, work on them. You will likely see a remarkable improvement in your results if you implement the suggestions above.